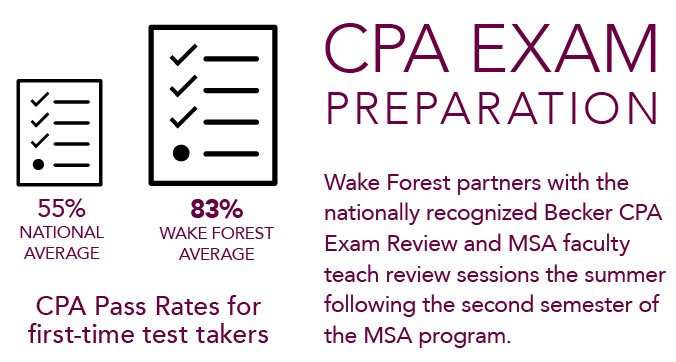 For more than two decades, Wake Forest has remained committed to developing passionate, ethical leaders in the accounting and business professions. Since its inception in 1995, the MSA program has grown into one of the largest and most recognized programs of its kind in the U.S. Our program’s reputation with leading firms enables us to consistently place 100% of our students into jobs at graduation. The MSA program offers students both two- and three-semester options, with the latter offering a professional internship in the spring semester. For those students who haven’t taken our pre-requisite coursework, we offer these classes on the Wake Forest campus the summer before the MSA program begins. A Wake Forest MSA graduate is a highly sought-after candidate. How can we tell? In recent classes, our students typically graduated with multiple job offers, launching their careers with competitive salaries at major regional, national and international accounting and finance firms. The average salary for a liberal arts undergrad with an MSA degree starts at roughly $55,000 as compared to $35,000 for those without an MSA degree (source: NACE's Fall 2015 Salary Survey). For careers in the assurance/audit practice area. Courses include Advanced Auditing and Assurance Services; Forensic Accounting; and Negotiations. For careers in the financial transaction and advisory services areas. Courses include Financial Markets, Products and Transactions; Advanced Financial Management; and Business Analysis and Valuation. For careers in the tax services parctice area. Courses include Tax Research Methods; Tax Policy and Planning; and Selected Topics in Taxation. Unlimited Backgrounds. Many Paths. One Outcome. 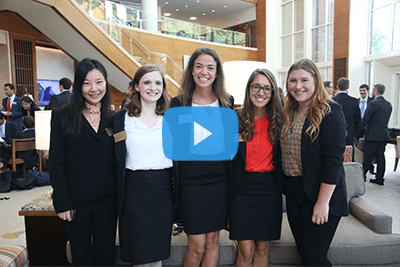 Master of Science in Accountancy: Meet our students from WFU School of Business on Vimeo.